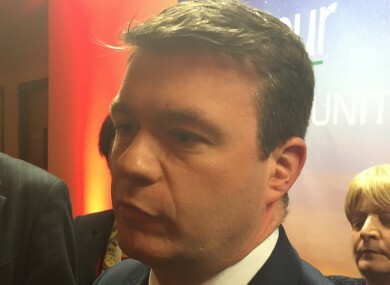 ENVIRONMENT MINISTER ALAN Kelly has declared that the current Fine Gael/Labour coalition is “one of the best governments in the history of the State”. A typically bullish Kelly was speaking to the media at the Labour party conference in Killarney this evening. Tánaiste and party leader Joan Burton later told delegates that Labour is targeting a historic second term in government. Delegates at the INEC on the outskirts of the Kerry town voted in favour of a motion for Labour to include a commitment to repeal the 8th Amendment in its next election manifesto. Labour Women chairperson Sinead Ahern said the motion was “not radical” – a view echoed by many delegates who spoke on it. Earlier, Kelly told the media that Ireland would be best-served by returning this government, dismissing speculation about working with independent TDs. “There is a natural inclination from Labour party and Fine Gael supporters to transfer to one another given the fact that we’ve come through so much as a government and probably one of the best governments in the history of the State,” he said. “By profession, I’m a chartered accountant. Unlike Gerry Adams, I’m good at maths. I knew the bank guarantee was a bust. And I shouted as much from the rooftops,” she said. Burton made the case that “coalitions are now firmly part of the Irish political landscape”, noting that it is nearly four decades since Ireland elected a single-party government. Around 650 voted on motions in the areas of social protection, communications, health and education before the night was out. Earlier in the evening, delegates voted in favour of a Labour Youth motion calling on the party to reinstate the full adult rate of jobseekers’ allowance for all claimants under-26 after it was cut in Budget 2014. The delegates voted down a proposal to refer the matter to a Department of Social Protection committee that would report in July. There where loud cheers in the audience as the original motion was passed. There are a total of 99 motions to be put before the Labour conference between tonight and Sunday morning. That does not include an expected emergency motion on Aer Lingus which is due to be debated on Sunday morning. Email “As Labour's conference opens, Alan Kelly says this is one of the best governments ever”. Feedback on “As Labour's conference opens, Alan Kelly says this is one of the best governments ever”.